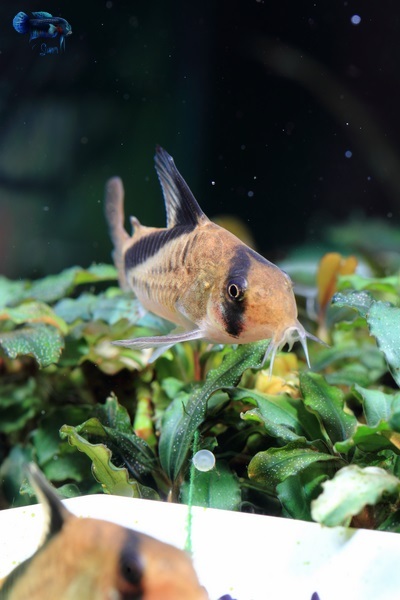 Corydoras is one of the biggest genera of Neotropical (from South or Central America) fishes, with more than 150 species. The species, which are not described or are considered a variant of existing described species, are given “C numbers.” This system was started by the editor of Amazonas magazine, Hans-Georg Evers, in 1993. 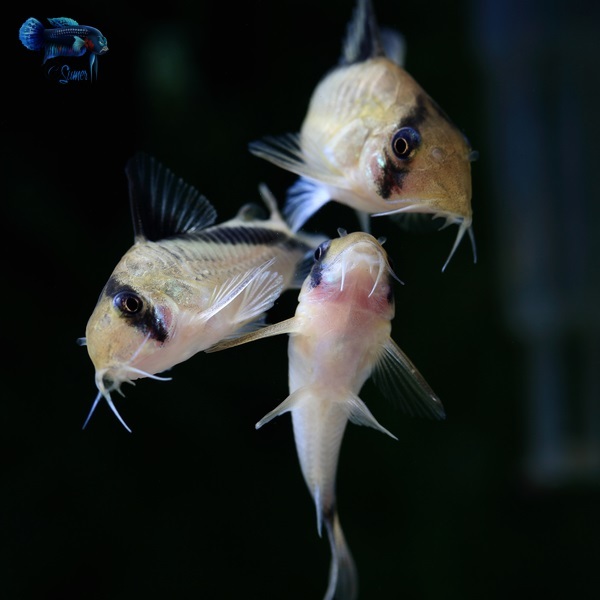 At my local club’s annual auction, when I was touring all the tables filled with many different fish, equipment, and plants, I spotted a bag of Corydoras. 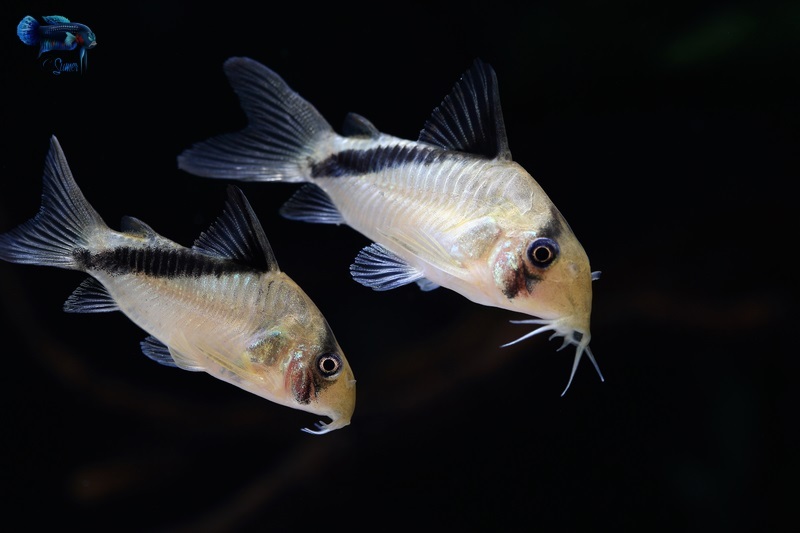 Personally speaking, whenever I heard of Cories, it reminded me of albino Corydoras paleatus, which I am not a fan of. But these cories were nothing like that. These had a black stripe that went diagonally on their body. That was something special in their appearance. 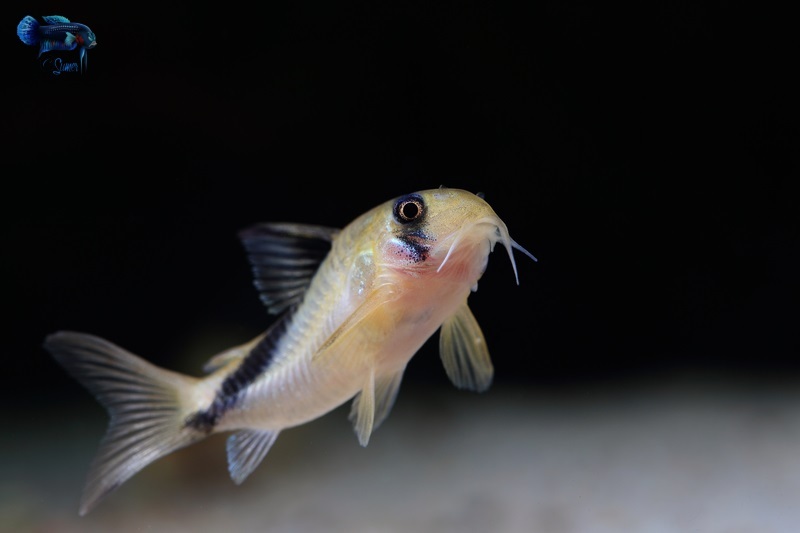 The species was Corydoras melini, sometimes called the False Bandit Corydoras. I Googled them, and finally decided to bid on them. Before going to these auctions, I make sure I have enough cycled, empty tanks at home to satiate my inner impulse-buying beast. I had a 10-gal. tank set up with fine sand as substrate and a hang-on-back type filter. It was a perfect fit for a group of 5 Corydoras. There were many people who wanted these fish, but I managed to snag them for my fishroom. 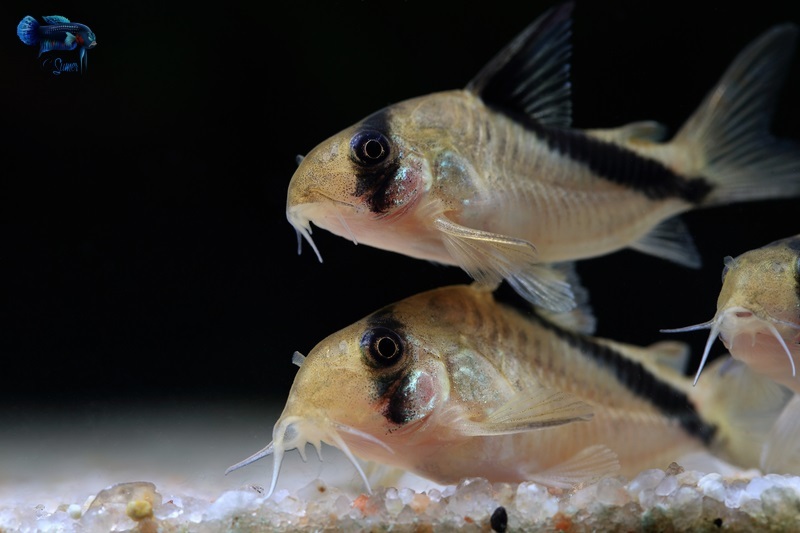 A pair of Corydoras melini. 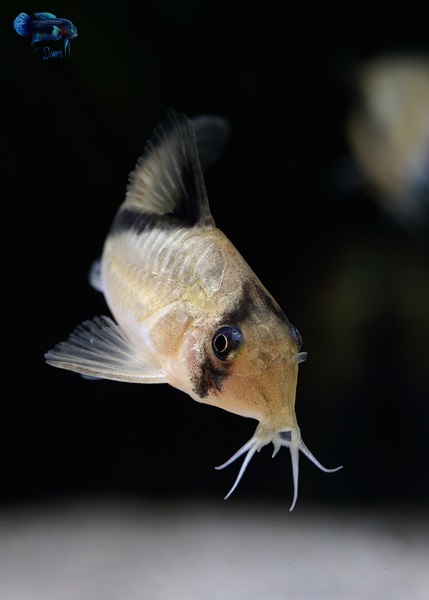 Since they have long barbels or whiskers, it’s a good idea not to have any sharp objects in the tank. They might hurt their barbels. I have spent countless hours watching them swim in the water. They have the most random pattern of swimming in the tank of all the fish I have kept. It was a great experience photographing them. Every second they were doing something unexpected. They seem to be a very easy fish to keep, provided you give them good food, good flow, clean water and places to feel safe when spooked. What else does a fish need, anyway? 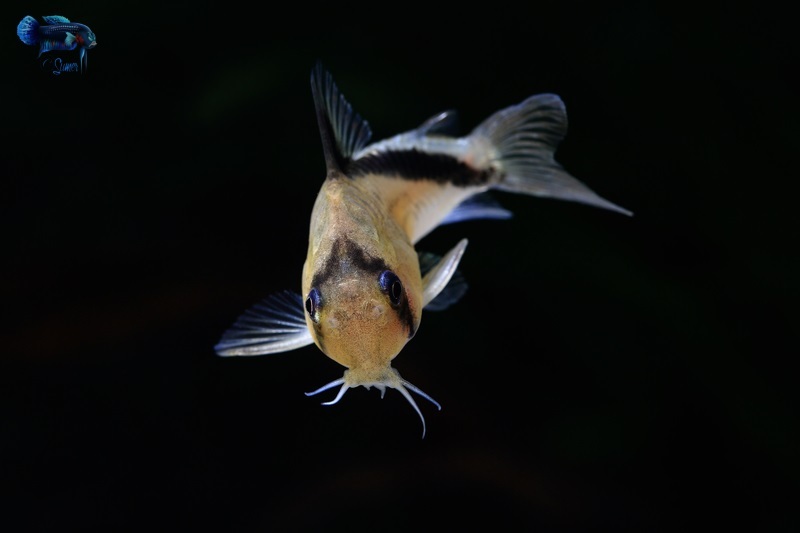 Every so often I get to keep a fish that makes photography so much fun again. I am so glad I got these fish. They are a very peaceful and quiet kind of fish. They absolutely love eating frozen bloodworms. 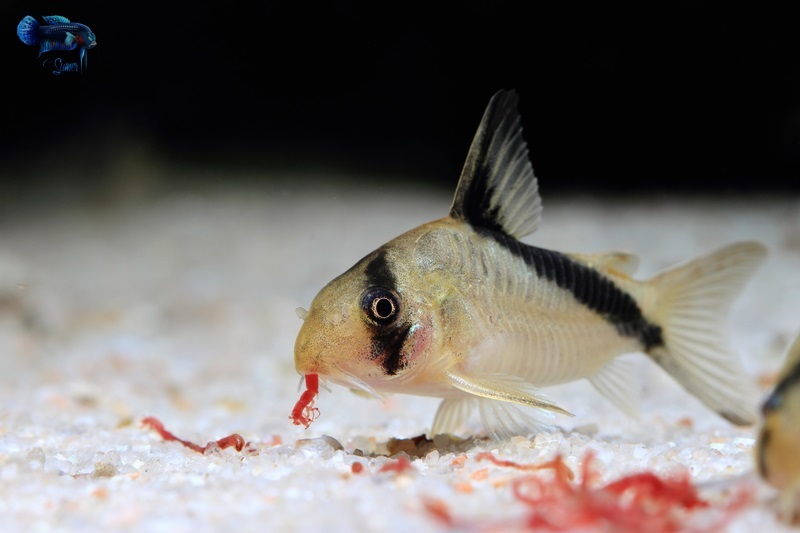 Five fish can gobble down two cubes of bloodworms in a matter of minutes. I feed them blackworms, bloodworms, white worms, glass worms, and Repashy meat pie. I had them at 75-76°F in RO water with a TDS of around 30-35ppm. The pH was around 6.8 and oxygen levels were pretty high because of the water falling in the tank from the HOB filter. I was fulfilling all the basic needs of this species, but the catalyst to trigger spawning was missing. While discussing it with a local hobbyist, he told me that he performs a “rain ritual” trick when there is a thunderstorm in the area. In his “rain ritual,” he changes 20-30% water of the tank with slightly colder and slightly acidic water. 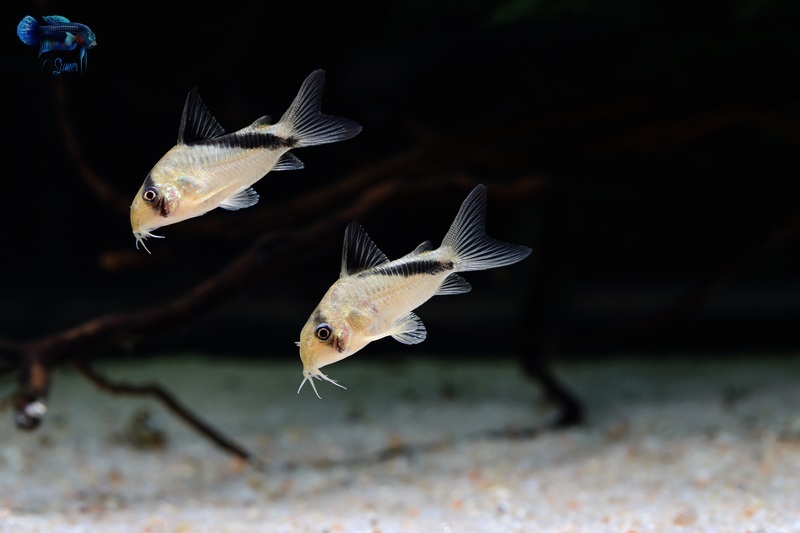 This cannot be done with all the corydoras fishes. 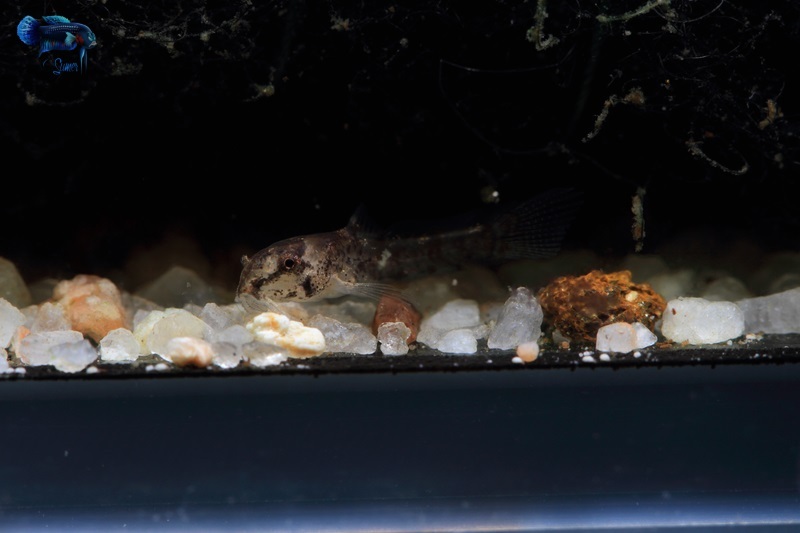 Some cories start spawning when they get warmer water. Reading past breeding journals is the best way to find out these little tricks and tips. So when there was a thunderstorm passing by (we have a lot of those here in Colorado), I performed a water change where my water was 70-71°F and its pH was around 6.5-6.6. I also put a lot of plants in the tank (I used Bucephalandra species). Suddenly, I could see a lot more activity in the tank. I had read that they like to lay the eggs where the water flow is strong. 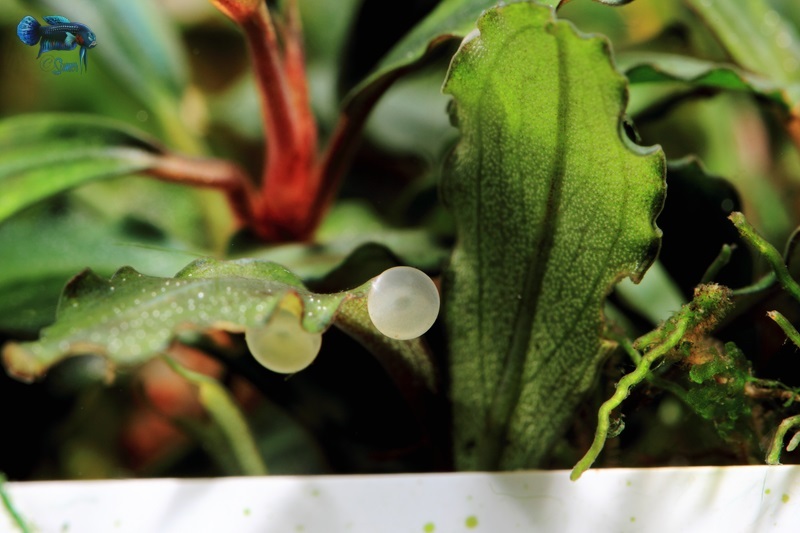 No wonder that the next morning I could see several eggs on the leaves of Bucephalandra and on the wall of the tank which receives strong water flow. I did not remove the eggs, because they were scattered in many different places and I wanted to see what the adults would do. Would they really eat all the eggs, as people claim? I knew that if they have bred once, they will breed again. You can see the embryo inside the egg in this photo. That is a stitching thread that the egg is sticking to. An adult cory, which is about an inch in size for size comparison. I kept looking at this fish, thinking it would eat the egg, but it did not. Two days later, the eggs were all gone. 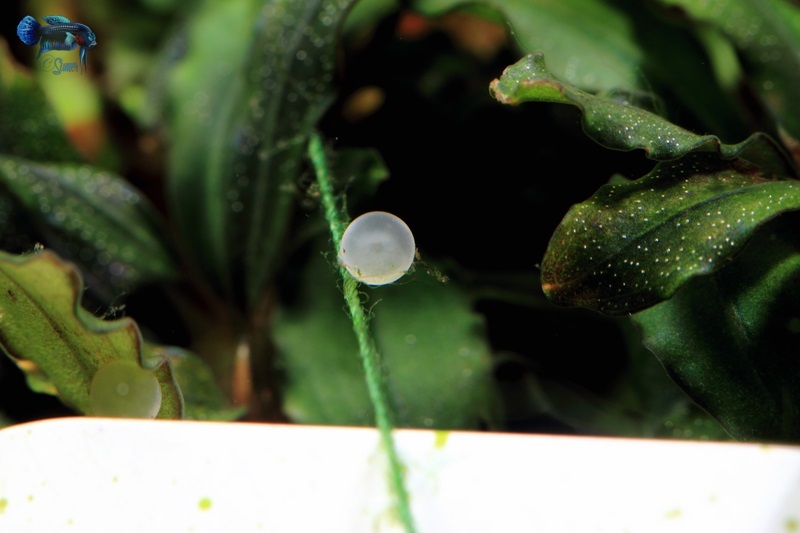 I could not see if the fry were there or not because I had filled the whole bottom of the tank with Bucephalandra sp. 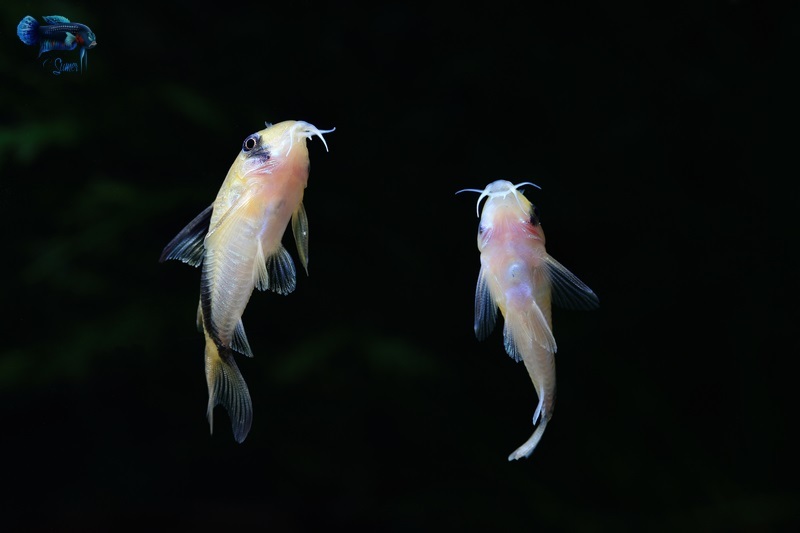 I kept putting in a small amount of newly-hatched baby brine shrimp, thinking that, if there were fry, they would eat them.Then, 15-20 days later, I spotted a few fry which were half a centimeter (0.2 inches) long and were already picking on bloodworms. 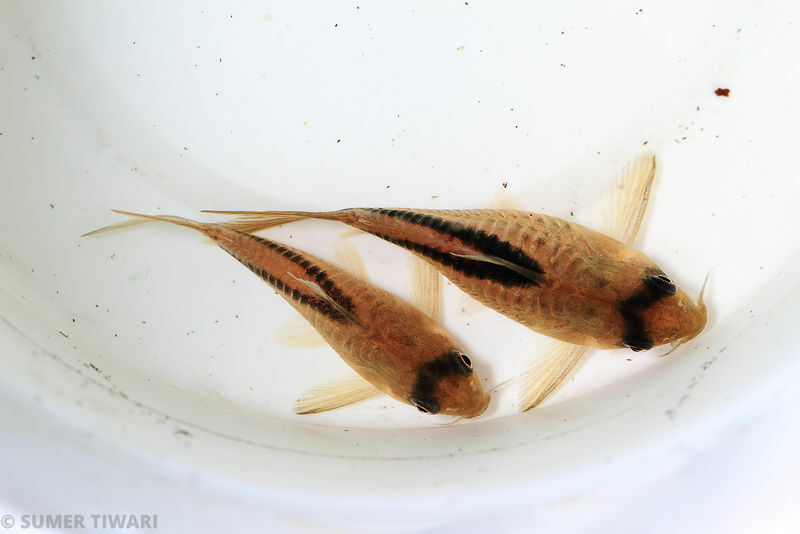 Common pool sand grains and Corydoras melini fry. These fry like to hide. I did not bother to move the fry, but when I moved some Bucephalandra plants to my planted tank, these fry hitchhiked and are now in my 48-gallon planted tank. They get to eat bloodworms and white worms. They are about a centimeter (0.4 inches) in length at 45-50 days after hatching. The adults have laid eggs twice since then. 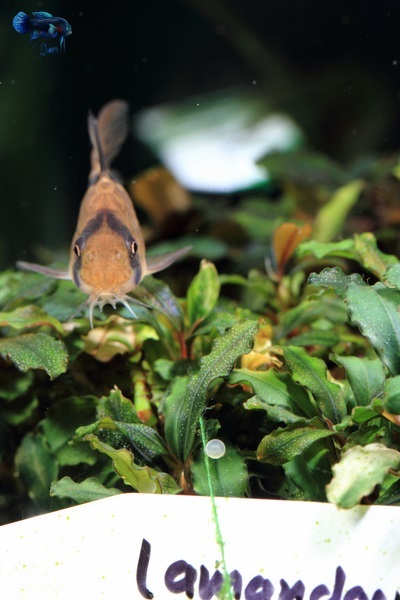 I keep seeing a few fry here and there but have not disturbed the Bucephalandra bedding yet. 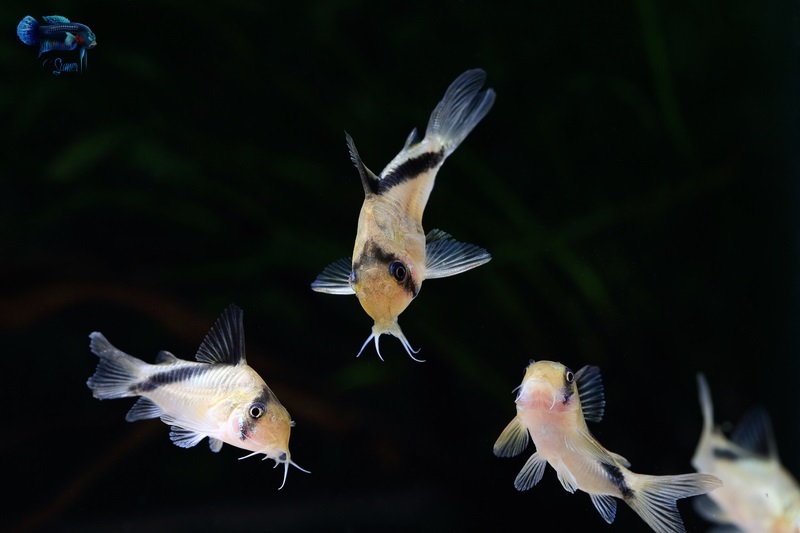 They definitely helped me gain more confidence in breeding catfish. I hope you all liked the pictures and my experience. I have this photo here and I am looking for a caption. Can you help me caption this image? Please leave your captions in the comments below.